Have a infant that has teeth coming in? I know with my daughter Sarah I could never wear my necklaces for worry of her grabbing and breaking them or just getting things in her mouth she shouldn't have. I was sent a cute pink set of both a necklace and bracelet. I love the color choice which is a nice neon-like pink. Dr Bloom's has made something stylish for mommy and practically for baby. So while you're standing there holding your child they can reach over and grab the necklace and you can be 100% at ease knowing that they can have it. You do not have to worry about it breaking because Dr Bloom's has placed the jewel on a rubber like neck piece so it has slack for you while baby pulls on it. Each necklace comes with the lace part ready for you to make as long or short as you would like simply take the ends and tie them together. What also makes Dr Bloom's chewable jewels wonderful is that if something does happen you do not have to worry because its not a expensive piece of jewelry. The bracelet is a cute bangle to add to the necklace so while you're sitting your baby has many options to chew on. Each Dr Bloom's item comes as a set of both necklace and bangle. Dr Bloom's Chewable Jewels have many choices of colors. Dr Bloom's also carries cute gift sets which come with 2 bracelets and onesie that says "chew on this". Dr Bloom's has eased the minds of many moms so why not ease your own. You can see everything Dr Bloom's has to offer by clicking here. Gonna buy a set? Why not save when doing so! 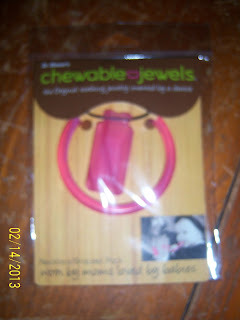 Use this code "2013F" for 20% off at www.chewablejewels.com. Enter to win a Spring Color Combo Pack! Enter the rafflecopter below, ends 4/14/13 open to U.S. residents only. Disclosure: I was given a teething necklace to help with my review. All opinions are 100% mine. I like the Bracelets, 2-pack (smoky quartz / plum). I like the Combo Bracelet & Rectangle Necklace in Blue Topaz. I love the Combo Bracelet & Hexagon Necklace in Red.